Composite materials of various types (unidirectional composites, short fiber reinforced plastics, nano-composites, ceramics, etc.) exhibit highly nonlinear, anisotropic, strain-rate and temperature dependent properties in mechanical, thermal and electrical fields. They often exhibit enhanced performance with respect to density as compared to traditional structural materials. However, simulating composite structures is complicated, and usually requires a micro-mechanical, multi-scale numerical approach. Digimat is a state-of-the-art, multi-scale material modeling technology for development and simulation of optimal composite parts. This advanced software tool can predict nonlinear macro-mechanical behavior of complex multi-phase composites by taking into account the process induced material microstructure. At micro-level, Digimat uses virtual modeling techniques via direct engineering. Whereas, at macro-level it provides comprehensive interfaces and mapping techniques for all major commercial finite element codes (Marc/Mentat, Abaqus/CAE, HyperMesh and Ansys Workbench), along with result visualization and other post-processing capabilities. Digimat-CAE is the interface module that handles data per element and can account for all kinds of process simulation effects like fiber orientation, residual stresses and temperature gradient. It can thus bridge the gap between processing simulations (like injection or drape molding) and implicit or explicit finite element analysis or lifetime fatigue analysis. 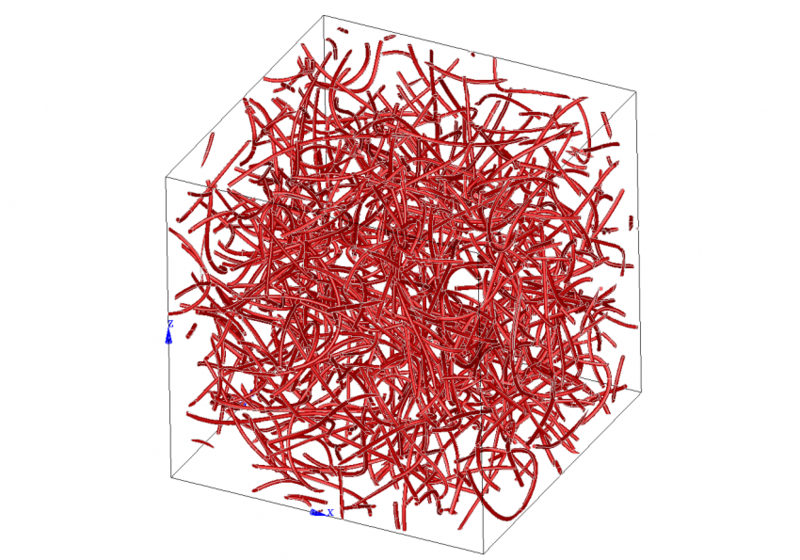 Digimat-CAE interfaces also provide libraries to perform structural FEA with one or several Digimat material models. It centralizes both upstream and downstream interfaces for coupled analysis by translating local microstructure into macroscopic material response. Digimat-CAE/Marc is the material library containing all linear and nonlinear small strain material models available in Digimat and it also contains all required interfaces in order to be linked with Marc solver. This interface also allows a user to take into account fiber orientation tensors computed by injection molding code. The setup for coupled Marc-Digimat analyses can be done in two ways. In the first case, one can define micro-level material modeling using Digimat GUI and generate the required material file, interface file and log file. The user then needs to manually change the Marc input deck in order to define the Digimat material, state variables, post codes, parameters for progressive failure analysis and options for finite rotations, creep, solver types, etc. In the second case, one can utilize the easy-to-use Digimat plugin for Mentat. The user can use the plugin menus to setup models, define solution method type, select fiber orientation files, add Digimat materials and scope them to specific element sets. Coupled Marc-Digimat simulation can be conducted with 3 types of solution methods. The MACRO solution is for weak coupling and for linear elastic and thermoelastic materials only. Digimat pre-computes the macroscopic material properties in a material file, which is then used by Marc structural code at each iteration of overall computations. This solution type is computationally simple as no interactive computation of material properties is performed between Digimat and Marc solver. A HYBRID solution is also a weak coupling procedure which uses a reduction technique that involves a pre-processing step in Digimat that is either performed at the start of the analysis or can be performed in parallel to speed-up this step on multi-processor workstations. It computes all the hybrid parameters and stores them in the material file. This step is equivalent to launching a large campaign of experimental tests on various orientations and loading conditions. The computed macroscopic material properties are then used by Digimat-CAE interface in order to communicate with the Marc code at the end of each iteration. Lastly, MICRO solution type exhibits a strong coupling, where Digimat interactively computes homogenized macroscopic properties for each increment and communicates that with Marc. This computationally expensive method gives most accurate results when applied to anisotropic, nonlinear, strain-rate and/or temperature dependent materials; and can also be used in conjunction with all failure and FPGP criteria. In order to compute macroscopic properties (thermo-mechanical, thermal and electrical) as a function of microstructure morphology (like inclusion shape, orientation, volume/mass fraction, etc. ), Digimat applies 2 cutting edge methodologies. In Digimat-MF, mean field homogenization theory is applied, which is essentially Eshelby-based semi-analytical methods like Mori-Tanaka double inclusion scheme, multi-step and multi-level methods for multiple-inclusion homogenization, first-order and second-order homogenization methods for nonlinear composites, Discrete Affine method and interacting law scheme. Progressive failure models implemented in this module are max components (stress or strain based), Azzi-Tsai-Hill, Tsai-Hill, Tsai-Wu, Hashin-Rotem, Hashin, SIFT or user-defined methods. Secondly, direct finite element analysis in Digimat-FE on representative volume elements (RVEs) can generate accurate and detailed field results. Although this may be a computationally prohibitive approach for simple RVEs, it is a useful technique for modeling complex material microstructures. Digimat-FE has its in-built mesher, solver and pre-processor; which enables it to run end-to-end FE homogenization analyses. It also provides interfaces to Marc, Abaqus/CAE and Ansys WB. The Marc interface in particular relies on Digimat’s in-built mesher and can thus export ready-to-run Marc input files. The results can then be post-processed using Digimat-FE or Marc/Mentat.